When Rachelle Katz, Ph.D., psychotherapist and author of The Happy Stepmother, created her website, stepsforstepmothers.com, she was floored by the response. Thousands registered, eagerly sharing their experiences. These moms needed support — and wanted to be heard. “It seems to have opened a crack in an emotional dam for stepmothers around the world,” she says. When families blend, everyone arrives with a set of rules, habits, even a family culture they’ve established in a previous life. As James Bray writes in his book Stepfamilies, no one enters stepfamily life problem-free. When Ushani Nanayakkara met her husband, Steve, his sons were 5 and 7, the same age as her own two boys. The couple eventually married and moved the brood into Nanayakkara’s Renton home, Brady Bunch style. Fourteen years later, they’re still together; the two oldest boys have gone off to college. “We’ve been really lucky,” she says. Nanayakkara’s family beat the odds. Studies show that 60 percent of second marriages end in divorce, most within the first two years. Carol Bailey — a stepmother herself — has worked with hundreds of stepfamilies in her practice as a Seattle family law attorney. She knows that it’s common for kids to resent the new stepparent, particularly if discipline was lax before the stepparent joined the family. Nanayakkara says that at first, this was a challenge for her family. “I was much more strict about bedtime, which resulted in huge battles.” She and her husband eventually settled on a bedtime ritual that worked for everyone: The boys were to be in their rooms for the night, but were allowed to read or quietly listen to music. Forging a connection with stepchildren presents another challenge. Bailey says stepparents should act friendly and interested without “overdoing” it. “Don’t try to be the new supermom or superdad,” she says. “And don’t rush in and think you’re going to give the children all the things they’ve never had before.” Go slowly, Bailey suggests, and give the relationship time to develop. Striking this balance can be particularly difficult for stepmothers of young school-age children, says Katz, because kids this age still need care and supervision. Stepmoms often take on all of the cooking, cleaning and chauffeuring. “They are so desperate to avoid being considered evil stepmothers,” she says. Stepmothers and their partners should decide which parent is responsible for which tasks. “When roles are clearly defined, it prevents stepmothers from overfunctioning and keeps the expectations of their partners realistic,” Katz says. Sometimes a shared interest or activity is the best way for stepparents to connect. Patrick Coleman, a 63-year-old Edmonds stepfather of two, had no children of his own when he married his wife, Cynthia, in 2009. Coleman, who has a Ph.D. in biochemistry, has found that his interest in academics offered a natural way for him to stay involved with his stepchildren. Helping them with their schoolwork has brought him closer to his stepchildren — and they’ve been getting better grades. 1. Don’t feel pressure to blend. 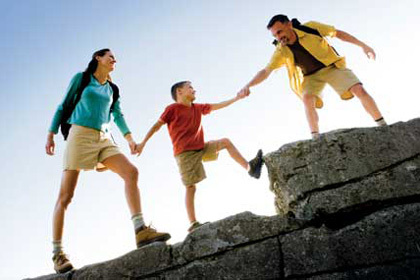 The term “blended family” can put undue pressure on families to achieve a level of harmony that may not be realistic. Stepfamily relationships are complex, and it’s not a failure if a family doesn’t blend. 2. Watch out for loyalty conflicts. In stepfamilies, a united front on discipline is essential. 3. If the biological parent doesn’t consistently back up the stepparent, he or she will appear to be taking sides — with the children on one side and the stepparent on the other. 4. Try to get along with your ex-spouse. The relationship between the biological parents can have a big impact on the success of a stepfamily. If the relationship is good, then the focus is more on parenting and finding what works best for the kids. 5. Put yourself in your child’s shoes. The transition to becoming a stepfamily can be very difficult for children, and they will be sensitive. Try not to take their behavior personally. 6. Don’t wait to seek outside support. Seek help right at the beginning, before you start having problems. The best support is preventive. Don’t be naïve about the task at hand.